It was an opportunity a 16-year-old Georginio Wijnaldum simply wasn’t going to pass up as fate presented him with an opening to claim a priceless memento from one of his idols. It was August 5, 2007, and he had watched on from the Feyenoord substitutes’ bench as his club played out a 1-1 draw with Liverpool at De Kuip in what was a pre-season friendly in name only. The Reds, complete with new record signing Fernando Torres, had come from a goal behind to level up the contest via Steven Gerrard’s 71st-minute effort on a hard-fought evening in the Netherlands. However, tempers had been threatening to boil over during the Sunday night fixture and, as it reached its conclusion, a late penalty awarded against Alvaro Arbeloa proved the tipping point. Pepe Reina may have saved Luigi Bruins' spot-kick, but not even the full-time whistle quelled the tension; however, while many were firmly fixated on the on-field disagreements, Wijnaldum – fresh from a breakthrough season in Holland – only had eyes for one man. Spotting Torres making his way from the field into the dressing room, the young midfielder knew it was a case of now or potentially never. “It was a game in Rotterdam in a tournament – the Port of Rotterdam Tournament,” Wijnaldum recalled as he chatted with Liverpoolfc.com at the team hotel in California. “I was sitting on the bench for the whole game and after the game, there were some arguments between the players but I spotted Torres standing there. “I liked Torres because of the way he played and scored goals – he was a really good player – so I went over to him and asked if we could swap shirts. That’s the thing I remember most about that night. 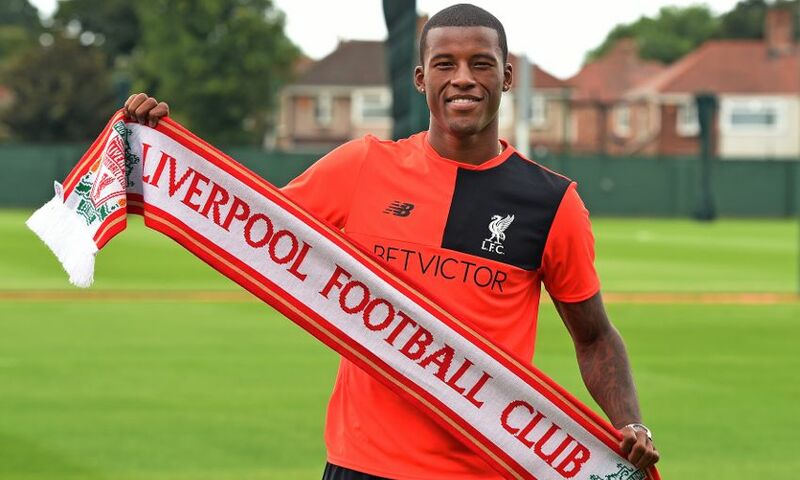 Little could the teenage Wijnaldum have known back then that just under a decade later, he’d be presented with a Liverpool jersey with his own name printed on the back. Nevertheless, the Reds had already spiked his interest and caught his eye, particularly following the transfer of Dirk Kuyt to Anfield one year prior. “Dirk Kuyt moved from Feyenoord to Liverpool… I know Michael Owen played for Liverpool… Bellamy, too…” he reels off with an infectious enthusiasm in response to a question about what he knew about the Reds back then. “Actually, in Rotterdam they love Craig Bellamy because he once said Feyenoord was a great club, so the fans there really like him. There were a few players I knew that played for Liverpool. “Then, when I started getting older, I saw how big Liverpool was with the titles they’d won and the big players they had. ‘Not interested in football’ seems a curious statement for a player who would go on to represent PSV Eindhoven and Newcastle United, as well as playing – and scoring – for the Netherlands at a World Cup finals in 2014. Nevertheless, Wijnaldum is only too happy to elaborate. “I was interested in other things like gymnastics. I did backflips, but it was just for fun,” he explains. “I liked to watch gymnastics at the Olympics. It was the thing I liked when I was young, so I did not really care about football – that didn’t come until a later age. “I preferred gymnastics, but one day my grandma said it was too dangerous and she didn’t want me to do it, so I stopped and turned to football. 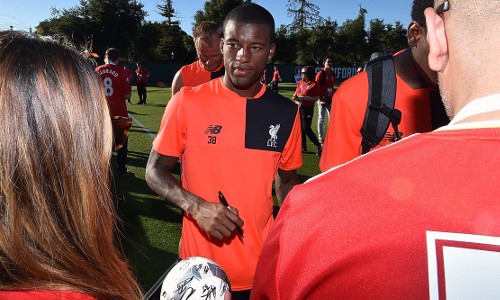 Wijnaldum’s affection for the game is clear to see for those who’ve encountered him in the United States this week, or had a chance to watch him taking part in his first few training sessions as a Liverpool player. The No.5 has rarely been sighted without a smile on his face since jetting in to Palo Alto just hours after signing on the dotted line to seal his long-term contract with the Reds. “It’s been good so far,” he insists. “First of all, I am really happy to be a Liverpool player. I’ve already said it – it’s a great club with a great history. “A lot of players want to play for Liverpool and I am blessed that I am able to. I’m happy and the days with the club have been great so far. “The people and the players have helped me – they’ve all been nice to me and helped me to settle in. “Liverpool is one of the biggest clubs in Europe. They’ve had some tough years, but if you look at the history you can see they’ve won a lot of trophies and titles. And so what of his first ever Liverpool jersey, the one so artfully obtained from Torres nine years ago?